October is the month when I'd like to spend most of my precious day off re-reading the Harry Potter novel series, watching classic Halloween horror movies, overall just trying to get into the festive spirit while lounging in my PJs all day. Of course, I have at least been trying to get rid of my bad habit of loathing the sheer idea of exercising and doing my best to be in nature as much as I can this year. As of now, I do find myself enjoying being outside and just embracing the morning sun and the fresh air. No matter if it's a day trip at the beach or just a casual morning stroll in the nearby botanical garden, being alone with yourself and observing the beauty of nature really relaxes and calms me down after a long week of being in the hectic working mode. I get to shut out all the outside noises and irrelevant opinions, I value the time that I can listen to nothing but my inner voice and organize my thoughts, through this process of loving my own company, I am able to write, inspired by the universe and truly express myself. A peaceful sunny afternoon stroll was exactly what I did on my day off and I wasn't planning on dressing up at all since I was not heading to anywhere important. Naturally, I still came up with a seasonal appropriate outfit I absolutely adore and I figured what better ways to show you guys than writing a blog post about it? To me, the color red is just gorgeous on any women. It is beautiful and luxurious, feminine yet powerful at the same time. Red seems to give such personality and style, however, I have encountered certain people that are just hesitant to wear such a "bold" choice of color. Well, with the right styling and color-matching, I do believe we can master the color red and incorporate it into our daily wear with confidence and ease. I wore a really pretty designed vintage style red floral printed blouse and matched it with a velvet black pencil skirt. To top it off, I chose a pair of ankle boots to go with the whole look. Lastly, for makeup, I put on a vampy red matte lipstick from Maybelline just to match it with my blouse. It is a super simple and easy outfit that took me literally under 5 minutes to put together, and it turned out looking amazingly-good. The red and black combination is also very edgy and semi-formal in a way, I think it'd be suitable for whether you are going out with friends or simply going to work. So that's it, hope you enjoy this post and feel free to let me know what your favorite color to wear for Autumn and how you would style it in the comments below. Til next time, stay happy, friends! I love this pretty blouse, babe! Thanks so much Esther :) appreciate it! You are gorgeous!! I love your style. Great look,! Love the shiny boots and the red floral top! 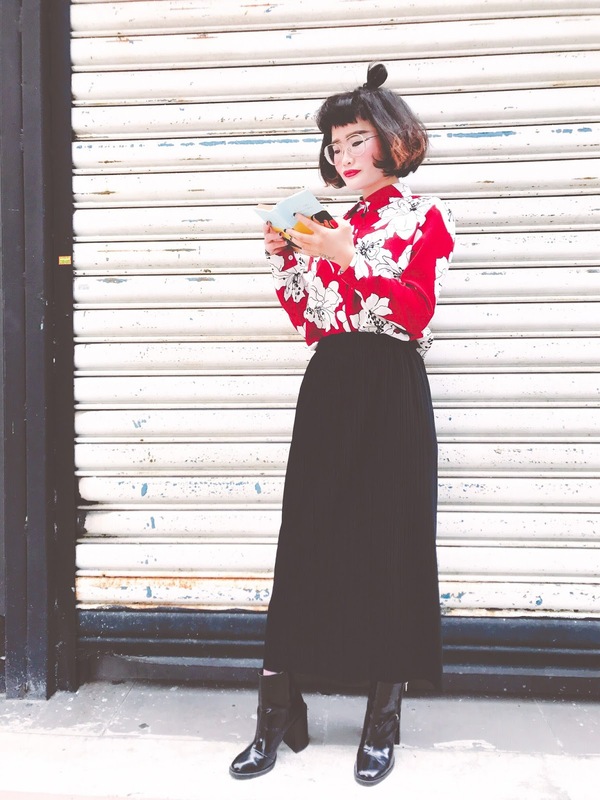 Love all the red in this look, so great for fall! You're looking so good in this outfit. I love the vintage shirt, such a staple. beautiful outfit, so stylish, that top is stunning !! I love everything about this outfit! 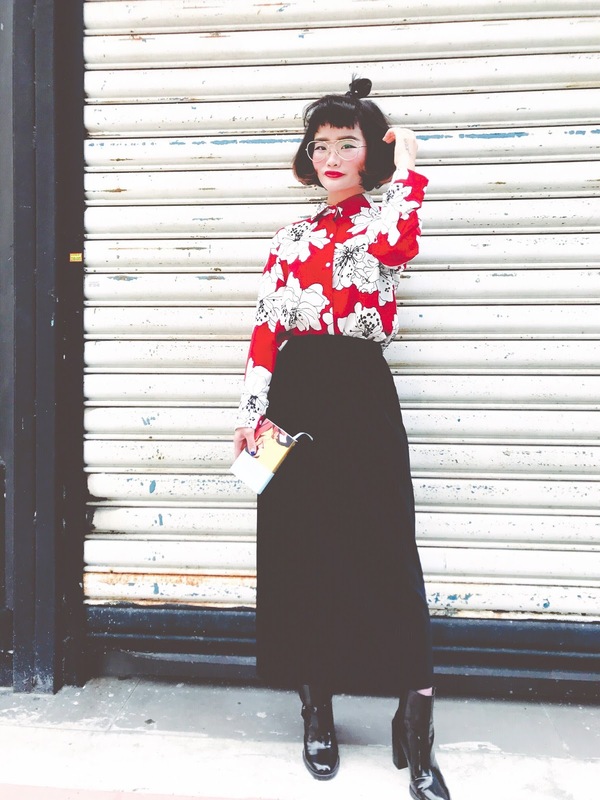 The red blouse is beautiful, and I love how you paired it with this gorgeous skirt!